My dad came to the rescue and helped me solve my kitchen sink plumbing problems. When he heard my tale of plumbing woe, he called me and told me he could probably show me how to fix it. We were a little concerned about how tightly the old pipes were melded together, so the night before the repair I sprayed WD40 on all of the joints. The J trap (forgive me if I don't get these names just right) came out surprisingly easy. The sink drain also popped up, so we decided now was the time to replace that too. So, off to the hardware store we went. I chose the local hardware store with the widest product selection, but the more inexperienced staff. We brought the old pipe & drain with us....and the guy in the plumbing dept. picked out replacement pieces for us and sent us on our way. We were out in the parking lot of the hardware store and I was feeling all optimistic. I told my dad that this looked like it was going to be a breeze. My dad kind of chuckled and told me that plumbing jobs had a way of going wrong. We got home, took out the new pipes and began fitting them in place. For some reason the top end of the J trap would not secure to the pipe coming out of the wall. We spent some time trying to figure out what was going on, when all of a sudden my dad realized what the deal was. The pipe coming out of the wall had a slip joint and the J trap they sold us was threaded (how's that for impressive plumbing lingo?). So, back to the hardware store we drove. We found the slip joint J traps, but they still were not set up to join the wall drain pipe in the same way as my old drain. In the end, we decided to buy a new drain pipe from the wall with a slip joint, a J trap with a slip joint and the new drain. My dad did most of the work in cutting down the new pipes and getting them together. We had one test run with a leak, but the second test held. Behold my shiny new drain pipe. Eventually I'd like to clean up that odd bend in the copper water pipes, but that's another project for another day. Painting the windows now probably wasn't the most logical order in which to accomplish things. I was going to wait until Spring, but I got tired of the roofers I had out last week giving me the "why bother, you live in a crappy house" attitude. 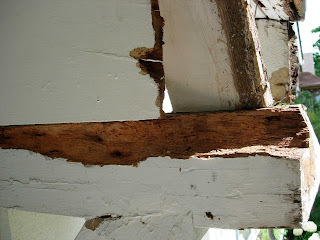 This even after I explained to them I pulled down the aluminum soffits and am restoring the wood. It was hard on StuccoHouse morale. So, this was a vanity painting. 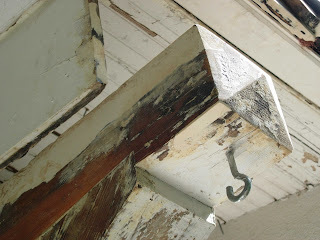 I still have not located & bought the backband trim to replace the exisiting trim that is in really bad shape. I have been dragging my feet on this mostly because I just can't wrap my head around the fact that it is cheaper for me to pay $100 for UPS shipping from a mill in NJ than it is to buy the stuff less than a mile from my house. At some point, I will just need to break down and buy the stuff and replace the trim. Most likely next Spring. The top horizontal trim board also is in bad shape. The soft wood around the hard grain is worn out and there is some "suspicious activity" going on behind it (i.e. punky wood). Next Spring I need to pull that board out, address some issues behind it and replace the board. The vertical boards are hard as rock and stripped quite well. So, I primed the vertical boards & painted them. I left the back band border trim unpainted (easier to pull off later). I didn't want to leave the top horizontal trim board unpainted, so I skipped the primer and painted it. From the street it looks almost properly painted. The more yellow that goes onto the front of the house, the more I like it. I think the yellow & gray make it look more "crisp" than the dingy white. I did make a minor change to the painting color scheme. I'll post more about that on another day. Finally, just to show some progress I've included a photo of the old aluminum storms & grungy front windows. Here is a photo of my ladder. 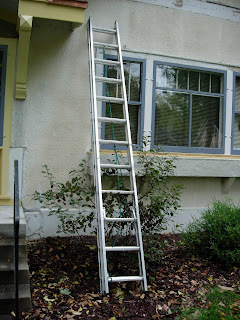 When I bought my house it had small trees growing in the gutters, so the ladder was one of my first purchases. When I was at Home Depot choosing the ladder, I decided that I should buy the tallest ladder possible. I figured that if I was going to plunk down the cash for a ladder, the extra footage would be relatively cheap. So, I went for the 24' model. That was thinking ahead, I told myself. It was quite a brilliant plan until the first time I tried to drag that ladder out of my garage myself. A minor miscalculation. It was so heavy I couldn't lift it. I spent much of the summer of that first year dragging that ladder inch by inch to where I wanted it to be. By the second and third summers I had finally developed the arm strength to lift the ladder (slightly) off the ground. Then the challenged became getting the ladder propped up against the house without looking like Wiley Coyote with the ladder swaying dangerously from side to side. I'm pretty sure I provided my neighbors with some humor...and possibly a little fear when they happened to catch one of these episodes. But, by the end of that third summer I was getting pretty proficient at carrying the ladder and getting it propped up against the house...without causing harm to myself or the house. So, this summer I was in the confident position of being able to actually lift the ladder and get it propped up against the house with only minor mishap. The only task left to master was getting the ladder back down once I was done working on the house. I had plenty of time to practice this while working on my front door overhang. I tried many different techniques. First, I tried to lean the ladder to the side and slowly lower it. This was hard because there came a point where the ladder was too heavy and most of the weight fell to one arm. Then I tried to pull the ladder vertical and slowly let it ride down the side of the house by pulling out the bottom. This made a lot of noise and wasn't that good on the stucco, so I abandoned it. Finally, I tried to pull the ladder upright than slowly lower it over my head...while at the same time walking backward out and moving my hand down rung by rung until the ladder was safely on the ground. It took months of fine tuning, but this became my preferred method. I have mastered the ladder. I am currently disenchanted with my house. I have a kitchen sink totally out of commission with a big hole in the drain pipe. For the better part of the morning, I listened to a flapping noise in my basement that I strongly suspect was a bat. He refused to fly out the open back door to save his stupid life. And this afternoon, I met with roofers to get bids to repair the hole that the copper edge roofers were supposed to repair. The first words out of their mouths were "why didn't the copper drip edge guys do this?" I smiled politely and forced myself not to scream or cry. So, tonight I am ordering out and sitting in front of the tv to watch Dancing with the Stars all the while pretending I own a new house in good repair. 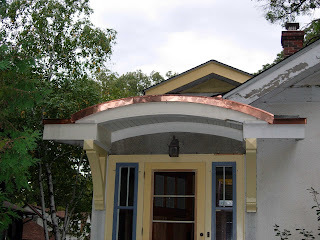 Basking in the warm glow of my newly painted & copper encased front door overhang. An ever so slight gloat of a smile while I thought to myself about how much progress I was making on restoring my old house. 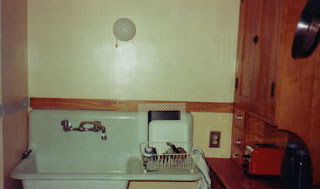 The dishes were waiting to be washed in the sink. I ran the water when all of a sudden I heard an unfamiliar woosh and felt soapy water on my feet. If I didn't know better, I'd swear this house timed these things. Looks like I get to reacquaint myself with my plumber. Okay, I took your advice and painted my itty-bitty beadboard "porch" ceiling haint blue. It is 25% the color of the wood storms below it. It looks surprisingly good with the yellow. I think it's going to be one of those quirky things that makes me smile whenever I walk up to the house. I've started to paint the rest of the overhang. The underside is beadboard. While I was up on my ladder, I got to thinking. 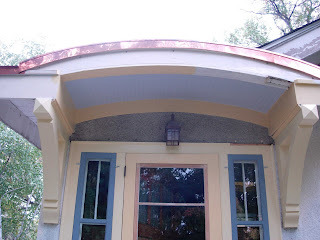 Light blue was a popular color for old house porch ceilings. It was called "haint blue." You can still ask for that in paint stores and they will sell you a light blue. According to old house lore, it was used either to ward off evil spirits.....or keep bugs away. 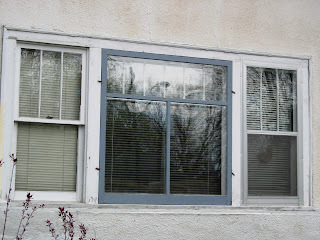 People often mistake the gray paint on the storm windows on either side of the front door for blue. What would it be like to take that same color at 30% or 50% (a light blue-gray) and use it to paint the beadboard? Too many colors - too busy.....or a neat nod to the past? 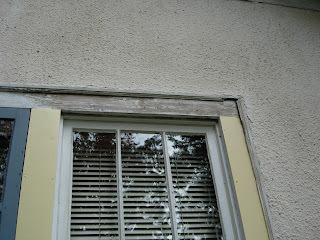 Last year at about this time I wrote a whiney post about how cold it was in my bedroom because I had the window sashes out to be restored and hadn't had time to reinstall them. Someone (for the life of me I can't remember who and wasn't able to find the comment - speak up if it was you) posted a comment about their beloved heated matress pad and how it kept them toasty throughout the winter. This idea stuck with me. So, this year as it started to turn cold (no, I STILL have not reinstalled the window sashes - get off my back ;-)) I hunted down a Lands End catalog to take a look at their heated matress pad offerings. I ended up ordering their HeatComfort Matress pad. It arrived last week, and I put it on my bed. I can see the allure of this thing. You turn it on, it warms your bed, you forget all of your worries and you fall into a coma-like sleep. As Martha would say "it's a good thing." I'm tired of talking about it. They came and fixed the drip edge today. It now covers all of the wood trim in the arch. It will patina to a nice golden brown which will match the oil rubbed bronze hardware on the door & light. I had talked to the last installer about fixing a gap in the roofing membrane under the eaves on the right side of the overhang. Apparently the guy who came out this morning didn't get that memo. So, I'll have to get someone else out to deal with that before winter sets in (sigh). I'm just weary of the whole thing. But I do like the finished edge, and it is a vast improvement over the aluminum that once was there. Wow, the yellow paint on the house is not nearly as bright as it appears in that photo. I also foget until I look at photos that there is a section of stucco under the arch that is still grey. 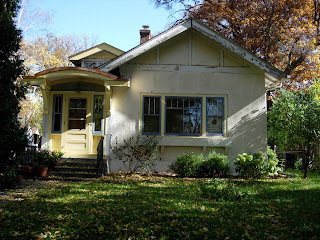 This is a mystery because as far as I can tell the house (and garage) have always been a version of light yellow/cream. Oh, and I finally painted the overhang brackets (more before & after photos of this shortly). Now I need to replace that one piece of missing trim (upper right hand corner of arch) and paint the wood.